Book Condition: Ships directly from Amazon! PRIME eligible. Hassle free returns and customer service through Amazon. May contain some highlighting. Supplements such as access codes, CD's etc not guaranteed. Comment: Ships directly from Amazon! PRIME eligible. Hassle free returns and customer service through Amazon. May contain some highlighting. Supplements such as access codes, CD's etc not guaranteed. Your process may be agile, but are you building agility directly into the code base? 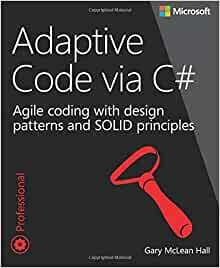 This book teaches .NET programmers how to give code the flexibility to adapt to changing requirements and customer demands by applying cutting-edge techniques, including SOLID principles, design patterns, and other industry best practices. 5.0 out of 5 starsGreat for the intermediate .NET programmer. Okay, first let me give a little bit of my background so that you will know whether or not this book is for you. First of all, I do not have a formal computer science degree. I do have a degree in electrical/computer engineering, but not computer science. I have had a few formal classes in object-oriented design, data structures and algorithms, operating systems, and an elective in web programming. As far as my experience goes, I have about 1 years of professional software development experience with .NET and C#. I knew nothing about SOLID or TDD at the time I started reading the book. I actually didn't even know what an interface was, but did know that I needed to improve my software design skills. On the back of the book it actually says "Not for beginner programmers... for experienced developers", but I would still consider myself a beginner with C#. Maybe Gary just explains things so well, and makes the concepts easy to understand. Now, for the review. I have skipped the first chapter which is about SCRUM and some project management concepts I am not interested in right now. That being said, I am about 70 pages in and wow... I've had my eyes opened up to the way that software is supposed to be done. The second chapter of the book (where I started) talks about the basics of layering patterns and managing dependencies through simple interfaces. I immediately started finding examples that I could go and apply at work. That's the great thing about this book, Gary will explain a concept, and is right there with an example to show you how its done. How exactly did this book help me? I was able to design some interfaces (not previously knowing what they were) using some of Gary's patterns and I have a much better way of managing my libraries/dependencies now. Gary's formula for describing the different problems in software, and then explaining/giving examples on how to handle them makes this a great buy! I will update this review if things change as I continue into the book. I highly recommend this book. It’s not for the absolute beginner, but if you’re an intermediate or even senior programmer I think you’ll find this book very helpful. The book starts with a summary of Scrum, and I think it makes a good quick reference. For a more in-depth description of Scrum, see the book Scrum: The Art of Doing Twice the Work in Half the Time, which I also recommend (I actually listened to the audiobook). The chapter on dependencies and layering was an excellent discussion on organizing projects in Visual Studio solutions. The idea is to minimize dependencies between your code and external APIs. This helps to untangle your code and keep its components isolated, which makes it easier to maintain them. I applied this concept to one of my projects and I immediately saw the benefits. The book has a chapter on unit testing, but it’s more of a refresher. If you really want to understand unit testing well, read The Art of Unit Testing and Growing Object-Oriented Software, Guided by Tests. Also, I much prefer using NUnit and NSubstitute as my unit testing and mocking frameworks. The book uses MSTest and Moq. The second part of the book discusses the SOLID principles. Each principle gets its own chapter, so it’s quite detailed. What I really like about these chapters is that the author doesn’t stop at theory or simply tell you what your code should look like. He actually goes through relevant examples and shows you how to make your code follow the SOLID principles. The decorator pattern described in the chapter on the single responsibility principle was a huge eye-opener. I’ve known about this pattern before, but the way that he uses it to make code more adaptive is something I hadn’t seen before. It elevates interfaces as major players in your code. The third and final part of the book contains chapters that go through a couple of iterations of a sample project. The characters in these chapters use Scrum to plan the project and use the adaptive patterns in the book to develop it. It felt realistic and it was entertaining, and it helped to remind me of the practices recommended in the book. There wasn’t much that I disliked about the book, but one thing stands out. A lot of the examples (and even the sample project) focused on ASP.NET MVC development. Being a desktop app developer, I’m more interested in WPF and MVVM. He mentions them a few times, but only to say that the same principles as MVC apply to them. I don’t think they do. WPF and MVVM focus on data-binding, which make view models much more dynamic than the static view models in an ASP.NET MVC application. In summary, this book will help you in becoming a better developer. Your code will go from being a big ball of mud to clean code that is adaptive to change. 5.0 out of 5 starsBeautiful book. A must read. There are certain books that teach new technologies and then there are certain books that will change the way a person thinks until that time. For the later category, DI by Seeman, Design Patterns by GoF, etc., and this book fall into that category. I had one programming style (resulting code nothing but a big pile of mud) until I read this book. A game changer. There are some comments from experienced developers that there were coding errors in this book. Even then, for a beginner to an intermediate programmer, this book is a must-read if the programmer does not know SOLID principles. There are also some comments about the lack of necessity regarding 1st section of the book, covering Scrum. This is debatable. I thought that it laid a foundation quickly why Adaptive Coding to an Agile environment is required. I like the variety of topics covered and I think the author does a good job describing the principles, even if there are some factual errors as noted by other reviewers. However, I find the code examples to be extremely frustrating to work with. They are disjointed and full of spelling errors and missing project references which means it often won't compile. In fact, the code is so disjointed that the author has to provide a separate PDF explaining which listings match which solutions - and even that is full of errors and is missing an entire chapter leaving you guessing. Starting each chapter with a base solution and then walking through the steps to incorporate each principle would have been ideal; instead we get a snapshot of these changes taken at seemingly random points during the process and we're left guessing how he got there. 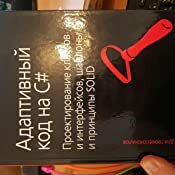 This book helped me understand SOLID better than I had before I read it and with that knowledge I changed how I code making myself better in the process. I highly recommend this to anyone who wants to take their C# to the next level.